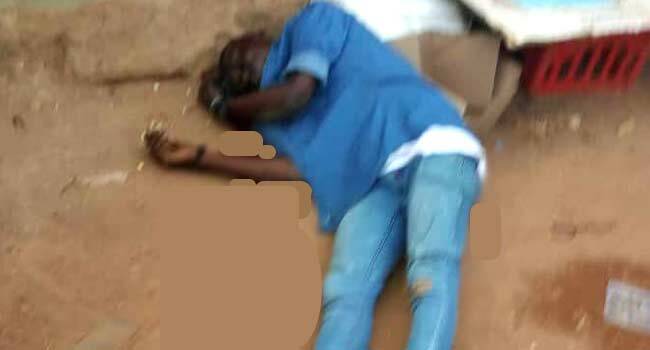 An amateur photo of the student of Rufus Giwa Polytechnic, Owo shot dead by suspected cultists in Ondo State on November 29, 2018. An eyewitness told Channels Television that the incident occurred at about 6:00 pm on Thursday in front of the main gate of the institution. The victim was said to have been shot by a group of young men inside a vehicle while on the motion. The incident was said to have caused a pandemonium as students and other persons around scampered for safety. The Public Relations Officer of the Polytechnic, Mr Samuel Ojo, has confirmed the incident. He disclosed that armed security men have been drafted to the area, saying there was no cause for alarm as normalcy has since returned to the school.